There are a number of benefits of saffron oil head massage. It strengthens the roots, prevents hair fall and gives unmatched shine. It nourishes dull hair. We, at Just Flaunt, have crafted a service that involves natural and organic Saffron oil. It’s 100% chemical-free. So you can rest assured of the results that regular massage would give you. It would make every strand of your hair healthy. Apart from that it is also absorbed into the scalp. Saffron Oil Head Massage is the perfect remedy for dry scalp. It adds life to your scalp too. 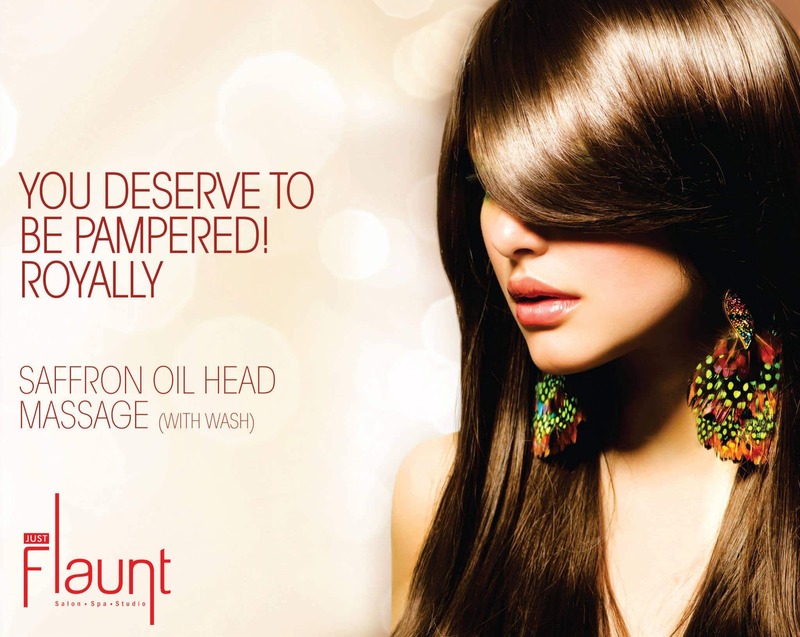 A unique saffron oil head massage that gives you lustrous hair and an unmatched sheen. If you are facing major hair fall problem, this one is a must-try. Known to be the secret beauty ingredient of the famous Cleopatra, saffron improves hair growth and make your hair lutrous. Saffron has been used a lot for skin treatments. But as an oil, it works wonders too. That’s exactly why we’ve launched Saffron Oil Head Massage. Saffron oil head massage (with wash) is a soothing therapy. It’s exotic. And it’s a great way to relax. The oil is natural & chemical-free. This includes a 30 minutes acupressure head massage. Shampoo post the massage. And Voila! When you leave the salon, your hair feels great. With this, you’ll call every day a good hair day. Next time you see a receding hairline, all you need is a happy Chumpy. Walk-in to Just Flaunt for a relaxing Saffron Oil Head Massage. It’s a stress buster. And it cures hair issues too. Soon, the improvement will show. After all, who doesn’t love a few hours of “me-time”. Wish to take a Saffron Oil Head Massage now? Book An Appointment Now. Click Here. How to take care of your tresses post hair smoothening and straightening treatment?